We've all been there: Summer has slipped away along with the long bright nights. But that doesn't quiet the call of the grill, does it? Sunshine or no, sometimes you feel like you just have to spark up the grill and cook up some juicy burgers and steaks. Don't let a little darkness stand in your way again. With Cuisinart's Grilluminate Extending LED Grill Light, you can see your entire grill clearly even after the sun goes down, making it a breeze to cook even when it's getting dark all around you. The Grilluminate Light is designed to keep you grilling long into those summer nights. It easily attaches to your grill in mere seconds — no assembly required. And then, with the touch of a button, 9 bright LEDs will light your entire grill surface. In addition, our unique extending sides increase your light spread, allowing you to see more and cook with ease. This light is made of durable glass reinforced nylon to handle the rigors of grilling, and its sleek design will look great with any grill. Is your day quickly turning to night? No problem, just turn on your grill light. 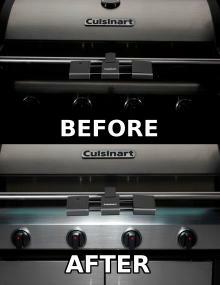 Why the Cuisinart Grilluminate Expanding LED Grill Light? Once you get grilling it's hard to stop. Sometimes the environment doesn't cooperate and it gets a little dark out there when there's still grilling to be done. But that's no reason not to light the grill. In fact, you don't even need to lug your heavy grill equipment around to find that one and only spot on the patio that has barely enough light for you to cook by. Simply give the Grilluminate Extending Grill Light a shot, and your grill will be crystal clear even after the sun sets. A grill light is nothing without some bright bulbs behind it. This light has three bright LED bulbs in each of the three light segments, totaling nine LEDs. This will deliver more than enough illumination to clearly watch your handiwork and check the doneness of your meats. The Grilluminate Light offers a unique expanding feature that will deliver the light exactly where you need it. Concentrating your cooking power on a small area? No problem — just compact the light and you will get a very focused beam. Grilling for the whole team? Also not a problem — simply expand the sides and you'll be casting light from side to side across any grill surface. The Grilluminate Extending LED Grill Light is made to last, boasting the world famous quality that Cuisinart is so well known for. The casing is formed by temperature-resistant, glass-reinforced nylon plastic, built to withstand the rigors of grilling. The arm is cast in tough, coated steel to live up to repeated daily use, while the adjustment bolt is a quarter inch thick and sturdy as well. The nine LEDs have a 10,000 hour life — so you'll be trading your grill in before they burn out — and the batteries can run for over 100 continuous hours. Julia Child let people in on the Cuisinart secret, and so did James Beard. They were among the first culinary experts to hail the food processor as a revolutionary kitchen appliance when it was introduced to America in 1973 by the late Cuisinart founder, Carl Sontheimer. They saw the food processor as a quick and easy way to make fine food and healthy dishes. 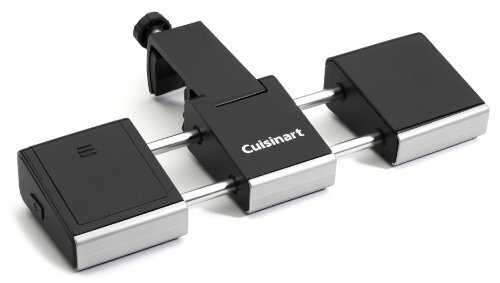 Today that legacy is alive and well — Cuisinart is a universally recognized name, endorsed by culinary connoisseurs such as Jacques Pépin and Hubert Keller, and remaining actively engaged in culinary education, including sponsoring such projects as Four-Star Chef Eric Ripert's popular public television cooking series Avec Eric. In addition, Cuisinart has a long-standing history of receiving prestigious design awards for a wide range of items. But the prestigious Cuisinart brand is not limited to food processors — plugged or unplugged, nobody covers the modern chef like Cuisinart. Cuisinart is a full-service culinary resource with a wide array of products, preferred by chefs and favored by consumers. Now you can take the world famous Cuisinart brand to your patio, lawn, tailgate, or campsite with our comprehensive line of outdoor grilling products also available on Amazon. Visit the Cuisinart Outdoor Grilling brand page on Amazon to see our full selection of grills and grilling tools, and make your next barbeque, picnic, or backyard cookout a smashing success. 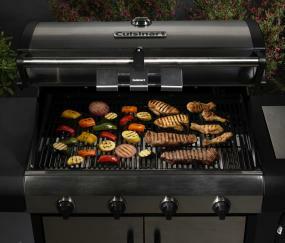 Savor the flavor, grill connoisseurs — come and taste the Cuisinart difference today. This light doesn't require any wiring, outlets, or technical knowhow to operate. Just insert three AAA Batteries (not included) into the battery pack, clamp to grill handle, and turn on. 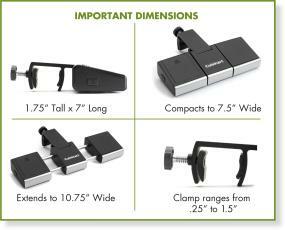 The clamp has an aggressive screw mechanism so it should only take a few easy twists; no tools are required to secure it to your grill. You spent a lot of money on your grill, so surely you care about how it looks. Shouldn't your accessories stand up to that same standard? This light is molded in dark textured black plastic and features stainless and chrome accents which look simply amazing on any grill. The unit's sloped profile gives it a sleek, modern look that matches your grill's aesthetic, and just as important, stays out of your way while you're cooking.